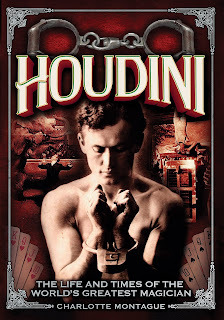 Even though the publisher shows a September 26 release date, Houdini: The Life and Times of the World's Greatest Magician by Charlotte Montague is now shipping from Amazon in the U.S. (mine arrives tomorrow). Aimed at general readers, the book runs 208 pages and is relased by Chartwell Books. Charlotte Montague has penned biographies of Sir Arthur Conan Doyle and H.P. Lovecraft also released by Chartwell. Purchase Houdini: The Life and Times of the World's Greatest Magician from Amazon.com (U.S.) and pre-order from Amazon.co.uk (UK - Sept 28). UPDATE: I've just received my copy and flipped through it. The book is beautifully laid out and comprehensive. Almost an encyclopedia in how it sections off people and events. Lots of photos, all familiar. Nice to see that it tracks Houdini beyond death -- into books, movies and television, right up to last year's Houdini & Doyle and this year's Timeless. I've not gotten into the text itself, but it appears to be a nice summation of known facts. I've already spotted some mythology (Bells of the Kremlin) and inaccuracies (Buried Alive), but there's mercifully no section on his "spy work." Oh, and it's a much larger book than I thought it would be. Almost brings me back to the glory days of Houdini coffee table books. I admit I'm a little hurt to not see my site listed in Further Reading (it appears to have been sourced for the later sections at least), but this is one I'm happy to add to my shelf. Thanks I just ordered a copy. Book received. See update above. My copy was received today: it is nicely produced but when I turned immediately to the account of the Blackburn Challenge in October 1902 the author repeats the historical inaccuracies found in other accounts. She says the challenger was an ex-soldier called Ralph Hodgson whereas we know it was William Hope Hodgson ex-merchant seaman. She appears to be repeating information from the awful book by Ruth Brandon. What a pity! Yep, she falls into a few traps and makes a few errors. All books do. But I agree this one is a whopper.